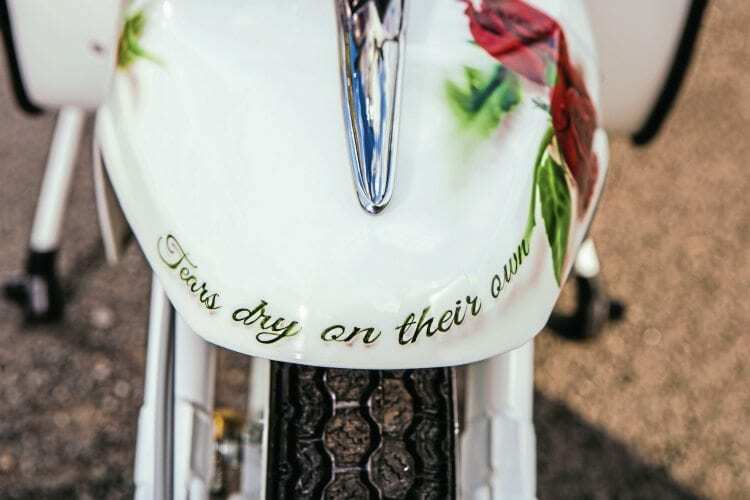 Tears Dry On Their Own has a dual purpose, firstly to promote the work of the Amy Winehouse Foundation, and secondly to eventually raise funds for the charity via auction, once the various promotional events have run their course. 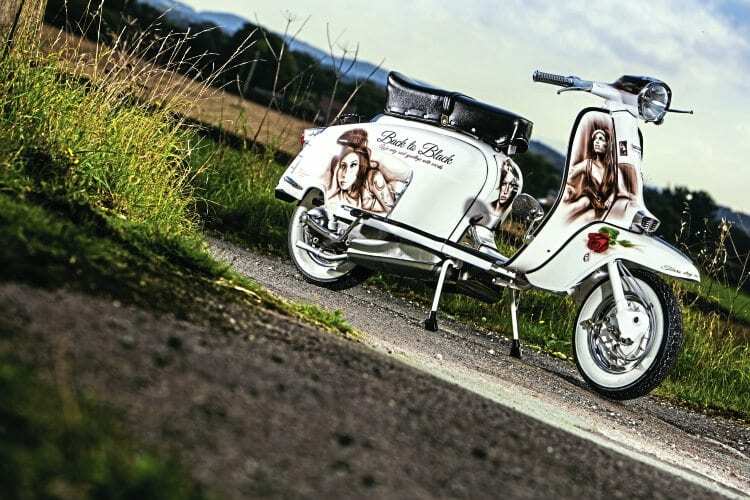 The name of the scooter, Tears Dry On Their Own, has been taken from a track off the seminal Amy Winehouse album Back To Black. 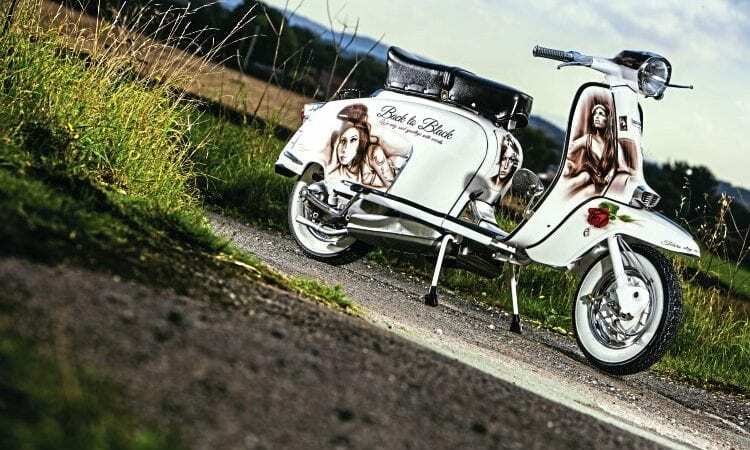 It’s hardly surprising why this name was chosen, given Amy’s tragic death in 2011, and over the coming months this Lambretta is going to be utilised as a promotional vehicle for the foundation. First outing for the finished machine was at an event in Camden Market on what would have been Amy’s 33rd birthday, five years on from the charity being set up. 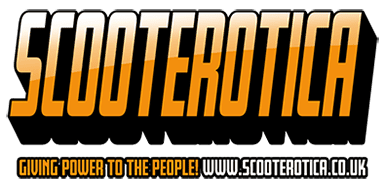 Creating this particular scooter was in effect a three-way split between the key people involved in the project. 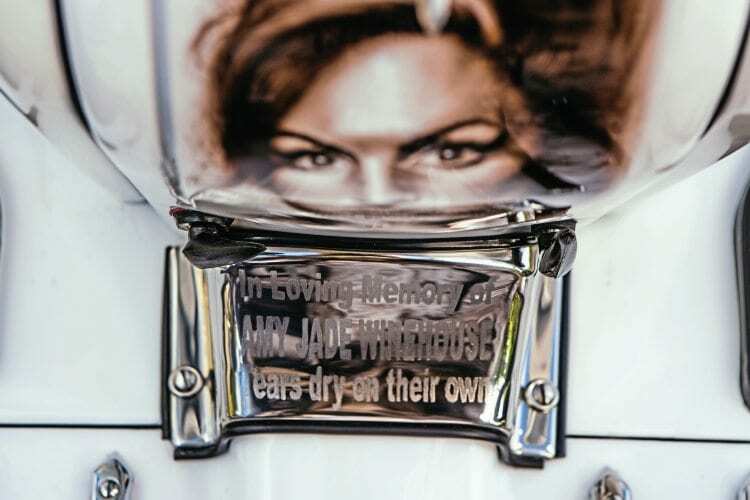 Sharon Judd works on the PR side for the Amy Winehouse Foundation. 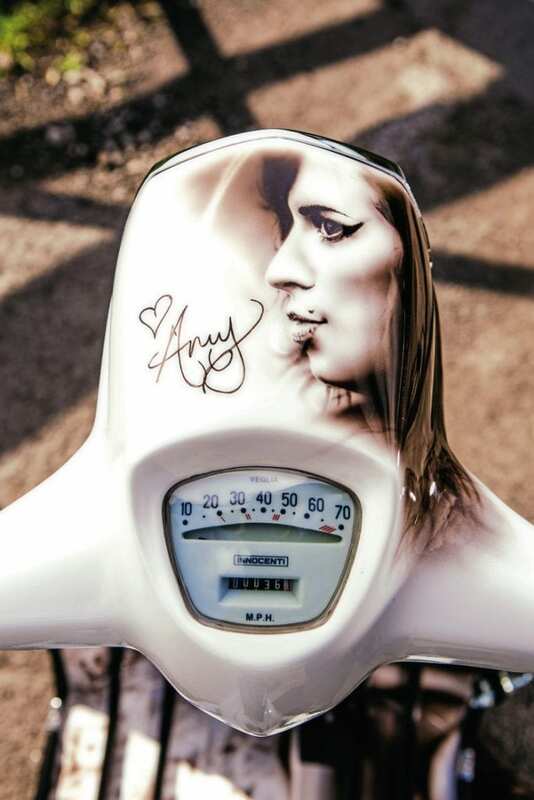 She said: “It started off as a basic idea, along the lines of wouldn’t it be good if there was a custom scooter with an Amy theme, which we could use for publicity, and then auction off to raise funds for the Amy Winehouse Foundation. From there I put a shout out on social media to see what sort of response, if any, there would be, that was March 2016. 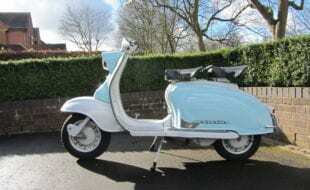 “A friend of mine, Graham Webb, came forward and I had a chat with him about what my idea was and would involve. He had a scooter and was prepared to get the work done. He even managed to turn it round from start to finish in around seven weeks! 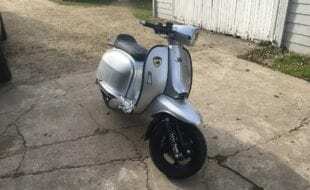 We were both excited about the project; it was a job to keep quiet about it while the Amy scooter was being created. 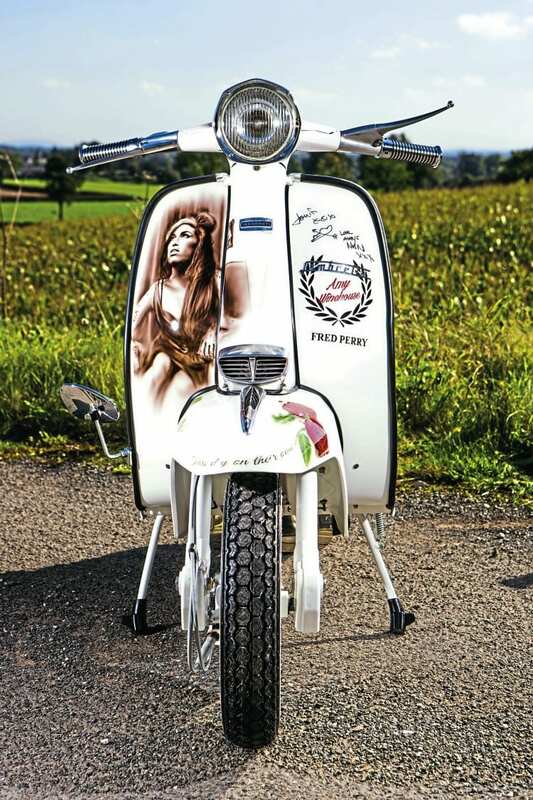 “Amy’s mum, dad and stepdad couldn’t believe the quality of the scooter, and the accuracy of the Amy murals. 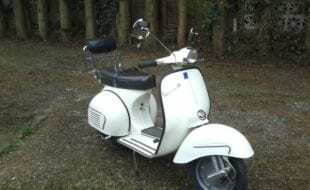 They all signed the scooter under one of the side panels, Amy’s mum Janice also signed the legshields on the anniversary of Amy’s birthday. Fred Perry came down to Camden Market on what would have been Amy’s 33rd birthday, Fred Perry being the first of many we hope will be getting involved with this project. 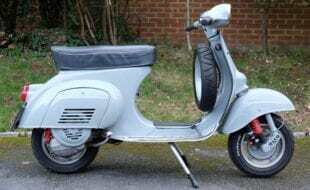 Lined up for next year is an appearance of the Amy scooter at the London leg of the March of The Mods tour at Fiddlers Elbow in North London. Wolfy will be compering the event but as yet the band line-up is to be confirmed. 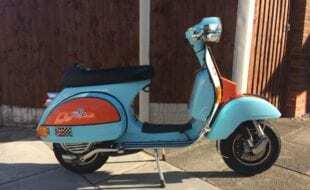 Graham Webb has been into the scene since the early 80s. When his friend Sharon Judd made the shout out on social media, he got in touch straight away. He said: “I responded to Sharon’s shout out back in March (2016). 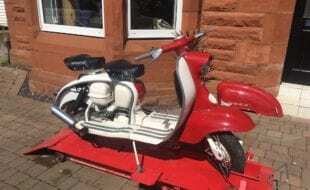 Instead of going for the obvious model of scooter, a GP, after discussing the idea with Sharon I based the project on an SX. After stripping the SX down, I went to three or four different places to scope out the artwork they were offering, before settling on Colin Fitzgerald at Garage Artwerks. 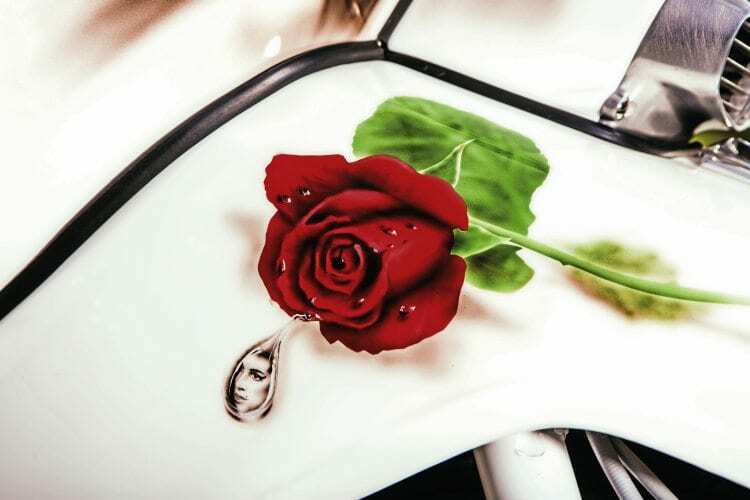 The artwork is not only outstanding in its accuracy and clarity, but captures the mood perfectly. 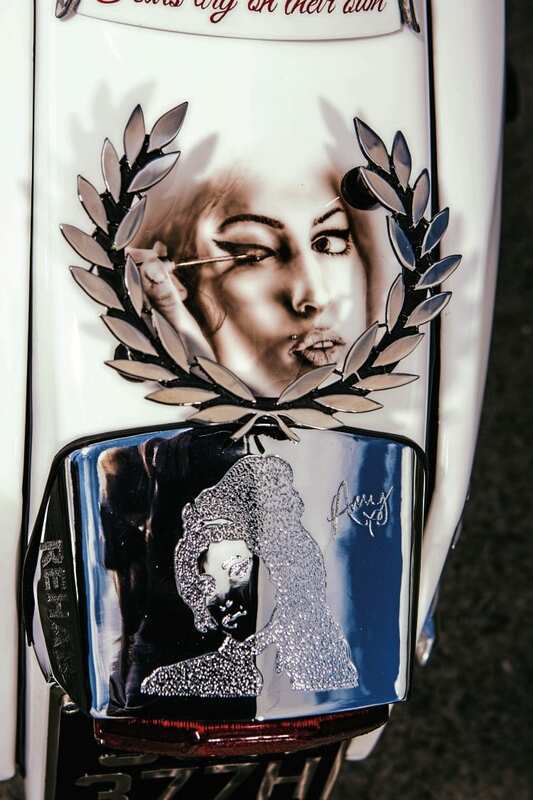 Colin Fitzgerald of Garage Artwerks is a master with the airbrush and it was he who was commissioned to provide the artwork on the promotional charity scooter for the Amy Winehouse Foundation. Fitting a very brief chat about his part in the creation of Tears Dry On Their Own into his understandably busy work schedule, Cohn said: As the brief for the murals was to use sepia tones it made producing the artwork relatively straightforward, and also fairly quick to complete. The hardest mural to do was probably the one that’s inside the legshields. 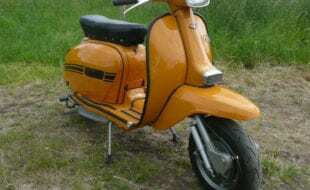 “By the nature of how the bodywork itself is shaped, it tends to make any art appear a little narrow. Out of all the artwork that piece was the hardest to produce. It had to be done three times to get it right. 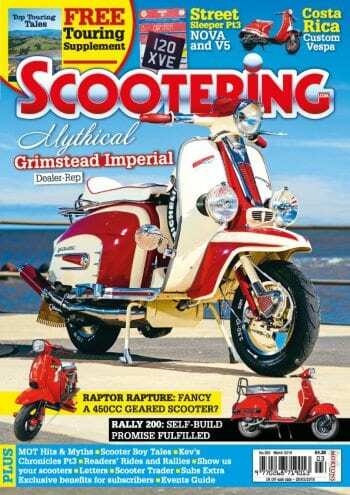 Before doing the artwork on the scooter I produced mock-ups of the various images for approval by the customer. “It never fails to make me smile when I hear comments about my portrait artwork like that really looks like…’. Well it’s a portrait. Isn’t that exactly what it is supposed to look like? Panel signed by Amy’s family. To inform and educate young people about the effects of drug and alcohol misuse, as well as to support those seeking help for their problems and those needing ongoing support in their recovery. To provide support for those most vulnerable, including those who are disadvantaged through circumstance or at high risk of substance misuse. To support the personal development of disadvantaged young people through music. Today the Foundation helps tens of thousands of vulnerable young people across the UK and abroad, helping them to overcome drug and alcohol addiction and many other difficult issues, such as an eating disorder, or self-harming. We do this by working alongside a wide range of specialist organisations and other charities whose expertise allows us to get help to the young people who need it most. 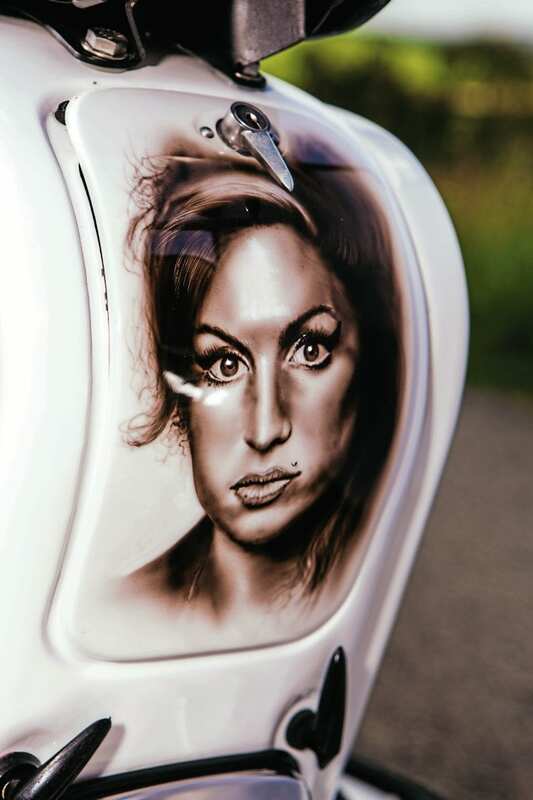 A central area of focus for the Amy Winehouse Foundation is “to support the personal development of disadvantaged young people through music”. To help do this, we share Amy’s very own studio with a new generation of aspiring musicians and performers. Amy’s Yard is a 12-week programme designed to provide vulnerable young artists aged 18-25, with the confidence and skills to become self-sustaining music artists, while developing their transferable life skills, preparing them to seek and attain employment, education and training opportunities. Participants come to us via the partner organisations we work with, and they are dealing with a variety of issues such as homelessness, mental health, unemployment or substance misuse. Inspiration and application, beautiful artwork. Opening in East London on Monday, August 22, the house pioneers a programme which addresses the specialist needs of female addicts, which are often more complex than those of their male counterparts. The project also highlights the need for a new approach to support female addicts. Named Amy’s Place, the house will provide a lasting legacy of support for women to reintegrate into society with the best possible opportunity of sustaining their recovery and building a fulfilling life. Women at the scheme will be provided with temporary homes in one of a dozen self-contained apartments and supported using what is known as a co-production model, giving them shared control over the services that aid their recovery. In addition to the above, there is also a Resilience Programme for Schools run by the Amy Winehouse Foundation, an alcohol and drug awareness programme currently in over 100 UK secondary schools. For children with life limiting conditions there is Music Therapy For Children, which takes place at Haven House Hospice in Essex. 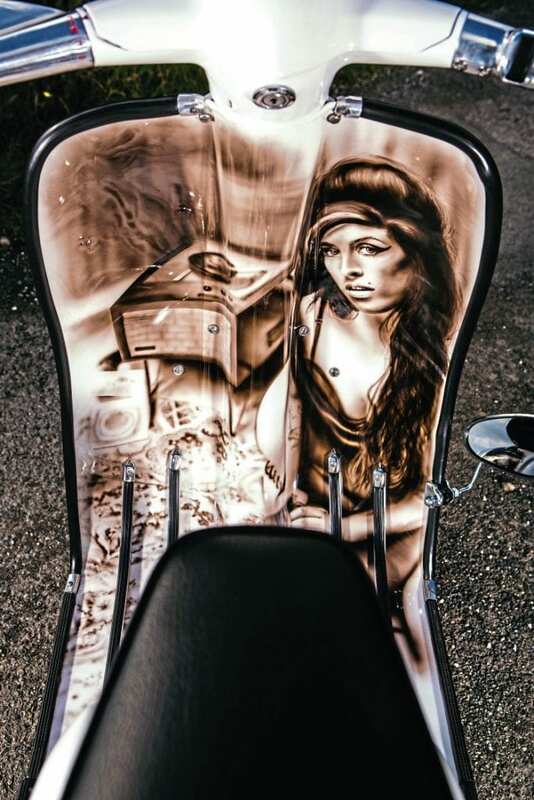 The Amy Winehouse music room has been funded by the foundation since 2014. Joined Susi Earnshaw Theatre School in ’92, a Saturday school where she developed her vocals and learned to tap dance. During her four years there she was in Sweet n Sour, a rap outfit. In 1997 she went full time at the Sylvia Young Theatre School. During her roughly 12 months there Amy, along with fellow pupils, appeared in an episode of TV comedy The Fast Show. She bought her first guitar aged 14 and started writing songs aged 15. She briefly worked as a journalist for World Entertainment News Network and at the same time she sang with local outfit The Bolsha Band. July 2002 she became featured female vocalist with National Youth Jazz Orchestra. Signed to 19 Management for Simon Fuller, began working with producer Salaam Remi. A&R man Darcus Beese eventually signed Amy to Island Records. Her debut album Frank was released in October 2003, and apart from two covers all the songs were co-written by Amy. In 2004 Frank achieved a high placing in the UK charts and Amy was nominated for two Brit awards. Later on in 2004 Amy, along with Salaam Remi, won an Ivor Novella award for Stronger Than Me. Frank was on the shortlist for the 2004 Mercury prize. Also during 2004, Amy performed at Glastonbury (jazzworld), V Festival, and the Montreal Jazz Festival. 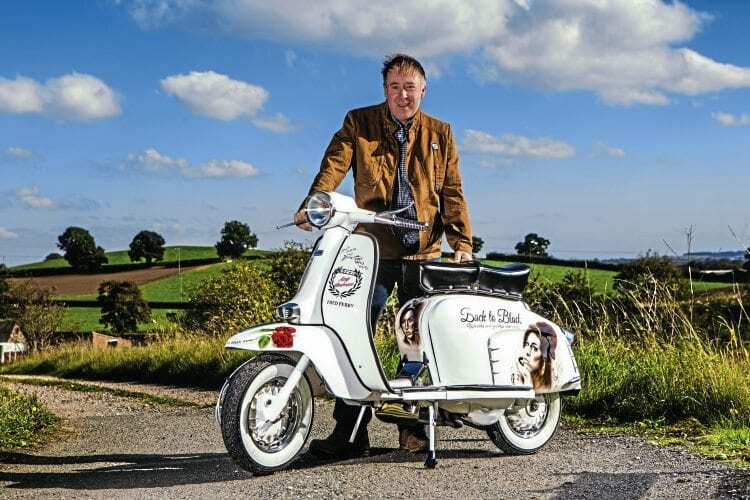 Graham Webb with the scooter. While Frank showcased a lot of Amy’s jazz influences, her second album Back To Black had more of a nod to girl vocal groups of the 50s and 60s. It also allowed her to display the soulful side of her vocal talents, emphasised by borrowing Sharon Jones’ backing band The Dapp Kings not only for the album recording, but also as her live band on her first US tour. Back To Black was released late in 2006, co-produced by Salaam Remi and Mark Ronson. On New Year’s Eve 2006 she appeared on Jools Hollands Hootanany, duetting with Paul Weller. Her second album topped the UK charts in 2007, going on to be the bestselling album of the year, notching up in excess of 1.85 million sales. During the summer of 2007 Amy performed at the Isle of Wight and Glastonbury festivals in the UK, Lollapalooza and Virgin Music festivals in USA and Rock Werchter in Belgium. A deluxe edition of Back To Black was released late in 2007, the additional disc included single B-sides, live tracks and Valerie, the latter earning a Brit Award nomination in 2008. She embarked on a UK tour November 2007 which was cancelled part way through. Amy performed Valerie at the Brit Awards, and in February she won five Grammy awards (which earned her an entry in Guinness World Records book 2009 edition), with Mark Ronson winning one for producer of the year (non-classical) for his work with Amy. By March 2008 Back To Black had sold just short of 2.5 million copies worldwide. At the 2008 Ivor Novello awards Amy had nominations in three categories, winning an Ivor Novello for Love Is A Losing Game. She was also nominated for an MTV Europe Award as Act of the Year. All told, that year also saw her perform at eight summer festivals. During late 2008 her label Island were making enquiries about her third album, but a spokesperson for Amy responded that she had not been given a deadline for it. In May 2009 she appeared at a jazz festival in St Lucia, which suffered from inclement weather and technical problems. In August 2009 she guested with The Specials at the V Festival. Various rumours and counter rumours circulated regarding her third album, with 2010 and then no later than January 2011 being announced. In January 2011 she played five dates in Brazil and in February 2011 she cut short a performance in Dubai. During June 2011 she commenced a 12 date European tour in Belgrade but all did not go well. She later cancelled her next two dates which were set for the following week. Later in June she cancelled the remainder of her European tour and it was announced at the time that she would be given as long as it took to sort herself out. Amy’s last live performance was in London, at Camden Roundhouse, on July 20, 2011, making a surprise appearance on stage with her god-daughter. Just three days later she died. Back To Black became the UK’s biggest selling album of the 21st century. Her last recording was a duet with the legendary Tony Bennett; the track Body And Soul was released as a single on September 14, 2011, what would have been her 28th birthday. Proceeds from the single went to the Amy Winehouse Foundation. It also won a Grammy award in 2012. An album of previously unreleased material, Lioness: Hidden Treasures, was issued December 2011 and went straight in at the top of the UK album chart on its week of release.